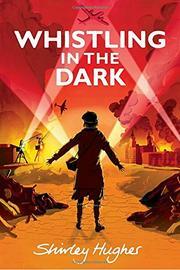 Schoolgirl Joan Armitage is trying to adjust to life in her suburb near Liverpool in 1940, when everyone tries to carry on a normal life despite nightly air raids on the Liverpool docks by the Luftwaffe. Joan’s father, a wireless operator on an oil tanker, was lost in the mid-Atlantic when his ship caught fire and sank, and she knows quite a few girls at school who have lost a father or brother in the war, too. Now Joan’s mother, brother, and two sisters are just getting by. Hughes’ matter-of-fact third-person narrative details how, despite the dangers of wartime, daily life can be boring, made bearable by friends, school life, an occasional movie, American music on the radio, and chores such as collecting salvage. While her previous World War II novel, Hero on a Bicycle (2013), offered the excitement of an occupied city (Florence) with a resistance movement, Joan’s comparatively uneventful life is not without intrigue: who is that mysterious man Joan has seen in her yard? What’s the story behind the new Polish girl in school? Why has Capt. Ronnie Harper Jones begun hanging around Joan’s house, and how does he always manage to bring parcels of goodies? Aside from Polish Ania, the book’s diversity does not extend much past Anglican Joan’s Catholic and Jewish classmates.